How do Plants Grow? Free Information on Plant Development! So, how do plants grow? This is a very important question because we need plants to grow for your own survival – not just for food but also for their release of oxygen in the air, else, we couldn’t breath. So what do they need to grow? Several factors influence (enhance, reduce or limit) plant growth. These factors are either environmental factors (external factors) or plant factors (internal factors). These three processes depend on the above-mentioned external and internal factors. 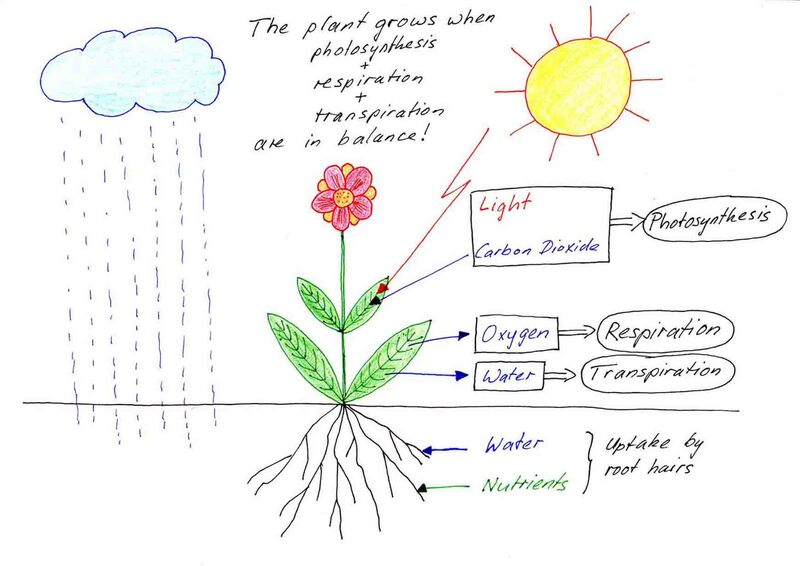 When these factors favour plant growth the plant will establish a balance between photosynthesis, transpiration and respiration. This is an important understanding in how plants do grow. During cell division (mitosis) they simply increase the number of cells. Another way to grow is to stretch the cell, to make it longer (cell elongation). Cell differentiation means that the plant is able to grow different cells that take up different tasks. Yet, there is not just one plant growth process. Plants make different growth movements, they have different growth speeds and different growth stages. Plants grow towards the sunny sky, right? This is called positive phototropism. Some plants even make a diurnal movement following the sun, this is called heliotropism. Yet, plants also grow roots that grow further and further into the earth and millimetre-by-millimetre they get closer to the centre of the earth. The gravitational pull makes the roots grow and this is called positive gravitropsim or geotropism. gravitropsim or geotropism. Climbing plants grow towards and around supporting objects. This is called thigmotropism. First, a plant seed must germinate. Then it grows into a strong plant (vegetative state). When the setting is right the plant starts to flower and results in plant reproduction by producing seeds (reproductive stage). The plant will get weaker and less reproductive when it grows older (senescence). Plants will go into an inactive stage that is similar to hibernation. They do this when they are faced with harsh environmental factors and their survival is at stake (dormancy).